The Raptor Center: I Wonder . . . What does Peregrination Mean? I Wonder . . . What does Peregrination Mean? For those who follow our social media, Maxime the bald eagle usually helps with our "I Wonder" series. Today, we felt Artemis the peregrine should ask, "I Wonder . 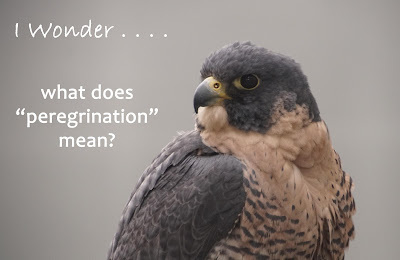 . . what does peregrination mean?" noun: Traveling from place to place, also a course of travel, especially on foot. From Latin peregrinari (to travel abroad), from peregrinus (foreign), from peregre (abroad), from per- (through) + ager (field, country). Ultimately from the Indo-European root agro- (field), which is also the source of agriculture, acre, peregrine, pilgrim (a variant of peregrine), and agrestic. Earliest documented use: 1475. Banded peregrine falcons through the Midwest Peregrine Society work (midwestperegrine.umn.edu) have been documented "peregrinning" to Guatemala, Costa Rica and other countries.